Conductor Jaap van Zweden was born in 1960 in Amsterdam and began his musical life as a violinist before moving from stage to podium. At nineteen, he became the youngest concertmaster ever of the Royal Concertgebouw Orchestra. 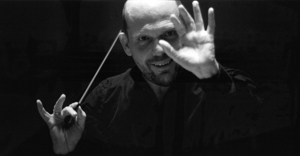 Van Zweden started his conducting career in 1995 and from 1996-2000 held the position of chief conductor of the Netherlands Symphony Orchestra in Enschede. From 2000 to 2005, he was chief conductor of the Residentie Orchestra. Since 2005/06, van Zweden has been chief conductor and artistic director of the Netherlands Radio Philharmonic Orchestra and the Radio Kamer Filharmonie. From the 2008/09 season on, he will also assume the roles of music director of the Dallas Symphony Orchestra, as well as of principal conductor of the Royal Flemish Philharmonic Orchestra.